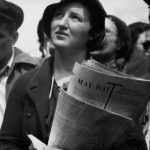 A major retrospective of Dorothea Lange’s photographic career returns to the U.S.
Dorothea Lange in Texas on the Plains, ca. 1935, Archival pigment print. 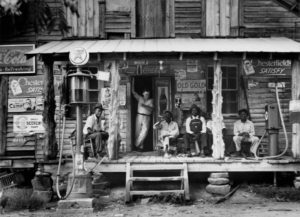 Dorothea Lange, Crossroads General Store, Gordonton, North Carolina, 1939, Archival pigment print. An exhibition now on view at the Frist Art Museum in Nashville, Tenn., affords an opportunity to assess the full career and vision of a photographer who is known to most people only through isolated images—above all, through one, the so-called Migrant Mother. This image, now vying with the Mona Lisa for the title of most iconic in visual history, is one of five similar photos that Dorothea Lange made in haste on a March day in 1936 at a pea-pickers’ camp in Nipomo, Calif., as part of her work documenting rural workers’ conditions during the Great Depression for the U.S. Farm Security Administration. However, as visitors to “Dorothea Lange: Politics of Seeing” (through May 27) will realize, Migrant Mother needs to be situated within a body of work that is not only powerful and original but that virtually defines the way the art of photography was brought to bear on social, political, and economic concerns during the tumultuous 20th century. The retrospective was organized by the Oakland Museum of California, which holds Lange’s personal archives, donated after her death in 1965 by her second husband, labor economist Paul Taylor. It was first mounted at the OMCA in 2017, after which it was shown at the Barbican in London and the Jeu de Paume in Paris, and the Frist is its final stop on this international tour. Around 130 vintage and contemporary prints will be on display, along with personal memorabilia and portions of a documentary film about Lange made by one of her granddaughters. After high school, Lange went to teacher-training school, then dropped out and got a job in a New York photography studio. 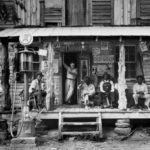 She apprenticed with photographers including the portraitist Arnold Genthe and studied at Clarence H. White’s private school of photography. At this point in her life, photography primarily meant portraiture to her, and when she moved to San Francisco in 1918, she opened a portrait studio that catered to society clients and did quite well. In San Francisco, Lange met her first husband, the Western painter Maynard Dixon. It was while traveling through the Southwest with Dixon in search of subject matter for his art that Lange got her first intensive exposure to people who were struggling to survive, especially Native Americans and Spanish-Americans in the Taos, N.M. area, whom she photographed. As the Depression set in, Lange had to look no farther than out the window of her Oakland studio to see suffering and hopelessness. She was inspired to take her camera out into the streets, capturing psychologically rich, haunting images such as White Angel Breadline, San Francisco (1933). In this photograph, the main figure, eyes obscured by his hat brim, has his back turned on his fellows in unemployment, which deepens our sense of his isolation. A happier image is May Day Listener, San Francisco (1934), a young woman whose almost beatific eyes express the hope that socialism connoted in those days. In 1935, at a small gallery exhibition of her photographs, Lange met Paul Taylor. She had been unhappy in her marriage to Dixon and soon left him for Taylor. 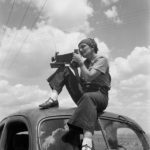 A political progressive with a particular interest in agricultural problems, Taylor motivated Lange to put her photographic abilities to more direct and practical use in the fight for better conditions and social justice. Together they traveled around California, documenting poverty, he in words and she in pictures. In 1936 they joined the Resettlement Administration, later named the Farm Security Administration, and expanded the scope of their travels under the mandate of this New Deal organization. It was during her FSA period, the second half of the ’30s, that Lange created her most indelible images, including Migrant Mother. Lange was never a purist; for her, photographs had to be in service of a human reality that was not aesthetic, and the integration of images with words of explanation and documentation was part of that mission. Uncharacteristically, Lange, who was tired and in a hurry that day, failed to take notes to go with Migrant Mother, and so the identity of its main subject, an Oklahoma-born Native American woman named Florence Owens Thompson, remained unknown to the public until the late ’70s, even as her image became a universal symbol. Thompson (who lived until 1983) and her family were very uncomfortable with the uses the photograph had been put to, beginning with its publication in the San Francisco News—Lange, they claimed, had promised them that it would only go into the archives of the FSA and not be published. A separate room in the Frist show is given over to the five different takes on Thompson and two of her young daughters, so that viewers can see how the one famous image—FSA head Roy Stryker said, “To me, it was the picture”—crystallized amid a series of incomplete approaches. After the U.S. entered World War II, Lange was assigned to the Office of War Information and found a new subject—the West Coast Japanese-Americans who were being uprooted from their homes and sent to internment camps. 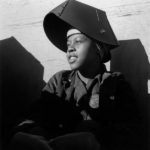 This time, her photographs, taken on the California coast and in the Manzanar camp in the Eastern California desert, met a less enthusiastic reception. In fact, because of their compassionate attitude toward a group of people who were regarded with suspicion at best and hatred at worst, they were heavily censored and largely sidelined from the public discourse at the time. 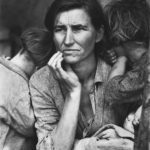 They are, however, powerful human documents in their own right, and their representation in the Frist show makes clear that Lange’s eye had by no means lost its sharp yet tender focus after the Depression years.